“Unity”… hmm, a word often used among Christians! It is regularly preached and sung about, and everyone admits that it is very important. Does this mean that there’s a healthy state of unity among Christians and Christian churches today? That depends on how high you set the standards. Or rather how high God sets them? And furthermore, what do we actually mean when we talk about unity? But the crucial question is: Why is it so important for Jesus that He prayed for it three times on the last night of his earthly life (Jn. 17:11-23)? And why is there an unlimited promise to hear and answer united prayer (Matt. 18:19)? Unity is not simply an option, it is a command. The battle for unity occurs on many different levels: we need to be united within ourselves (undivided), with God, with our marriage partners, in our families, in the local church, in a leadership team, in a city, in the nation, and ultimately… with all our brothers and sisters to the ends of the earth. To be deeply united with others is a wonderful experience, but the road to it can be extremely difficult. And yet, there are simple principles, outlined in the Bible, to help us grow in this, just as a tiny key can open a large door with a “click”… In short, without Him unity is absolutely impossible, but with Him it can be heavenly simple. 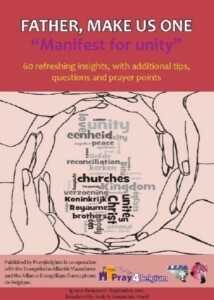 This booklet (48 pages) gives 60 refreshing insights regarding unity, working together, reconciliation, “kingdom” thinking, “city church”, the challenges concerning unity and the promises associated with it. Unity makes us invincible! Primarily addressed to leaders within the body of Christ, this is a source of inspiration for any believer who wants to expand his/her view on the church. Many tips, group questions and prayer points are included to make this booklet as practical as possible. Ignace Demaerel, served for 6 years on the board for the Evangelical Alliance Flanders. The text was reviewed by a number of prominent Belgian leaders. This booklet is a publication of Pray4Belgium, in co-operation with the Evangelical Alliance Flanders (EAV) and the French Speaking Evangelical Alliance (AEFB). It is also available in Dutch and French. This booklet is being distributed to all churches affiliated with the “Evangelische Alliantie Vlaanderen” and the “Alliance Evangélique Francophone de Belgique” (1 copy each); and also all English speaking churches in Belgium received one copy. Extra copies can be supplied upon request (price €5, or €6.50 incl. P&P). Please contact us for special rates for bulk orders).